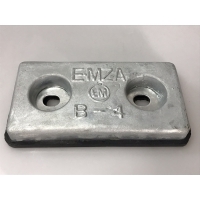 Categories » All » Marine / RV Maintenance	» Zinc Anodes	» Taiwan Zinc Plate (B-4).. Description : Taiwan Zinc Plate (B-4) 8" x 4"
Zinch especially only for Taiwan build boat! 8"x4"x1"